The road wheels are made from two castings, cartridge ball bearings and seals. 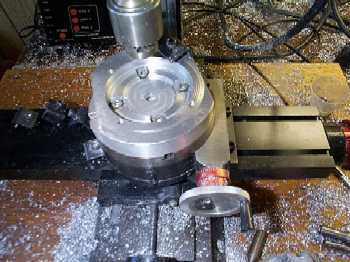 Holding wheel castings to a mill table is quite difficult, so I first made a custom jig that I bolted to the rotary table. 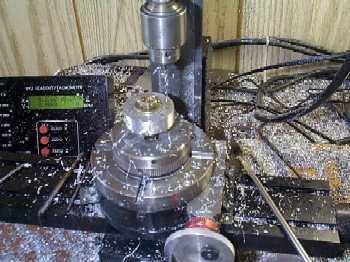 The jig has a recess that fits the wheel outside diameter, and has 4 each 10-32 threaded holes for clamping purposes. The back side of each wheel half is first bored for a press fit of a cartridge ball bearing. Then 10 equally spaced holes are drilled for wheel lugs, which will hold the wheel assemblies together. The top two wheels in the photo are outside wheel halves after drilling and boring are complete. The lower two wheel halves are inside halves. 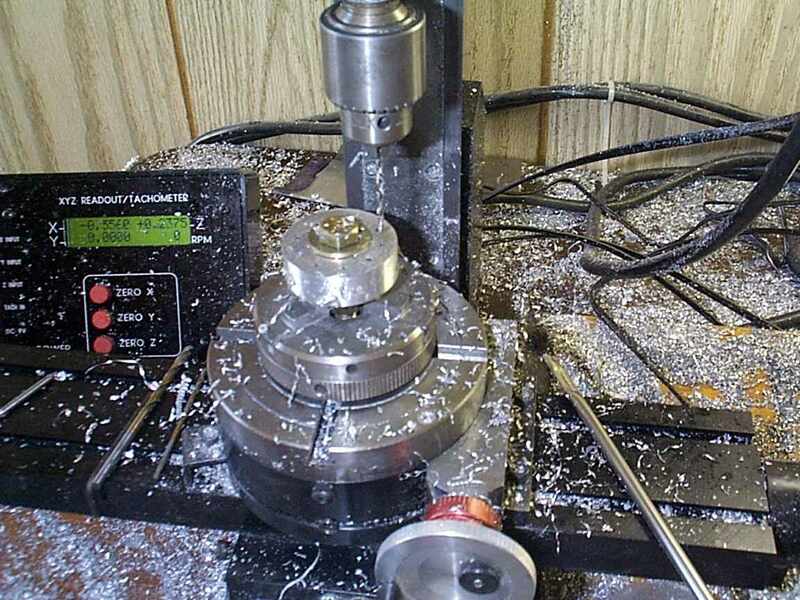 The next piece that each wheel needs is a plate that clamps the teflon seal against the inside face of the wheel. I started by cutting squares of 0.09" aluminum sheet and drilling center holes. 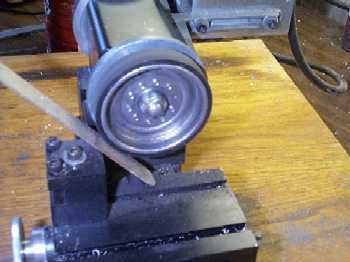 These plates were then bolted onto an arbor and turned on the lathe to the appropriate outside diameter. Finally, the bolt pattern is drilled through the seal plates. 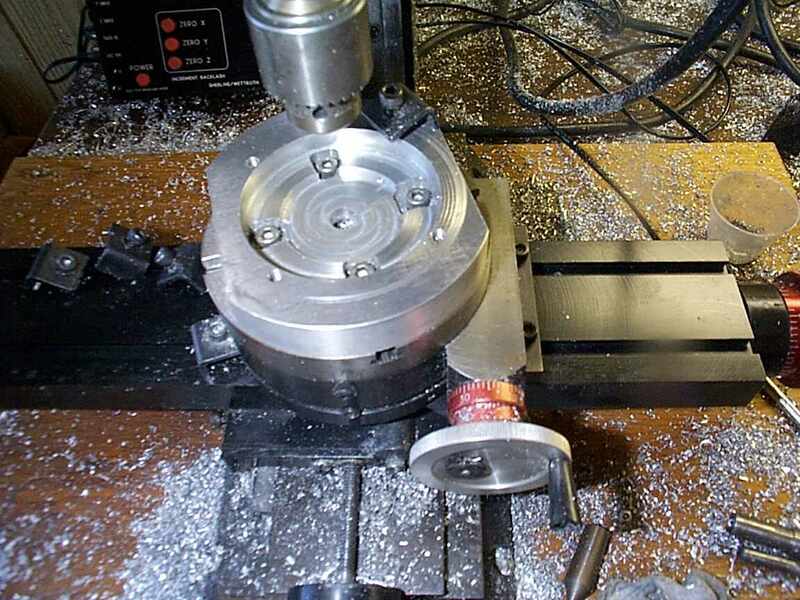 At left, a stack of seal plates is drilled simultaneously on the rotary table. The next step is to cast a neoprene tire onto each wheel half. At the bottom of the photo is a male mold that I used to make modelling clay molds for each tire. 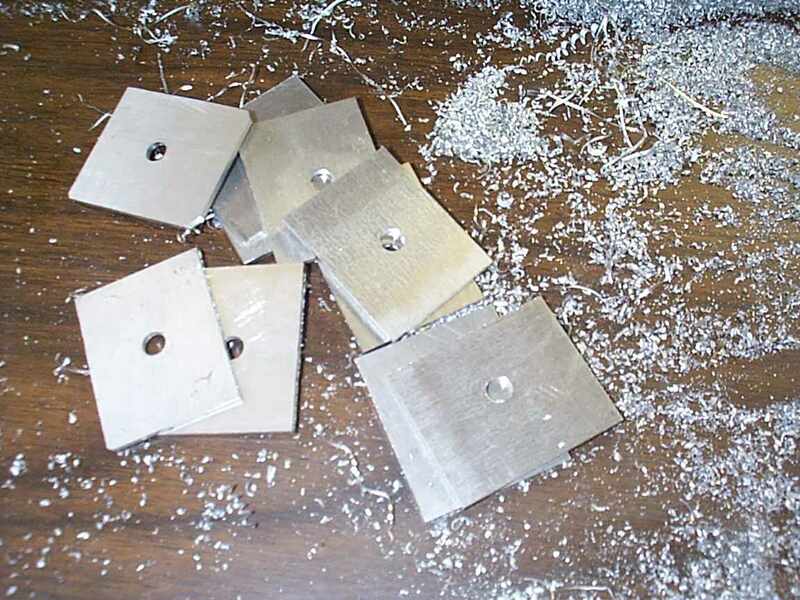 The mold was turned from a block of aluminum. On the plywood board are three molds that have been formed, and three wheel halves. A single bolt has been installed in each wheel so they are easier to handle. Note that it is impossible to form the modelling clay molds unless the aluminum plug is first swabbed with silicone release agent. Modelling clay really likes to stick to aluminum. 1) The wheels need to be degreased and the flanges roughed up. The final step is to grind the urethane to final dimension. I drilled and tapped a bolt circle onto a lathe faceplate so I could mount the wheel. In the photo you can see a diamond file being used to turn a wheel, using a tool holder as a steady rest.